Since I completed my PGCert at IOE, I value opportunities to attend events where HE educators come together to reflect on their practice. The Annual Education Day at Imperial was no exception. This year’s theme was dedicated on considering our practice while partnering with students and learning from each other. In order to prepare for the day prior to the event we were asked to read a recent report on engagement through partnership (Healey, Flint & Harrington, 2014). When Mick Healey (one of the authors of the report) came along to deliver the morning programme we were all prepared to unpack the idea of partnership and challenge our practices. 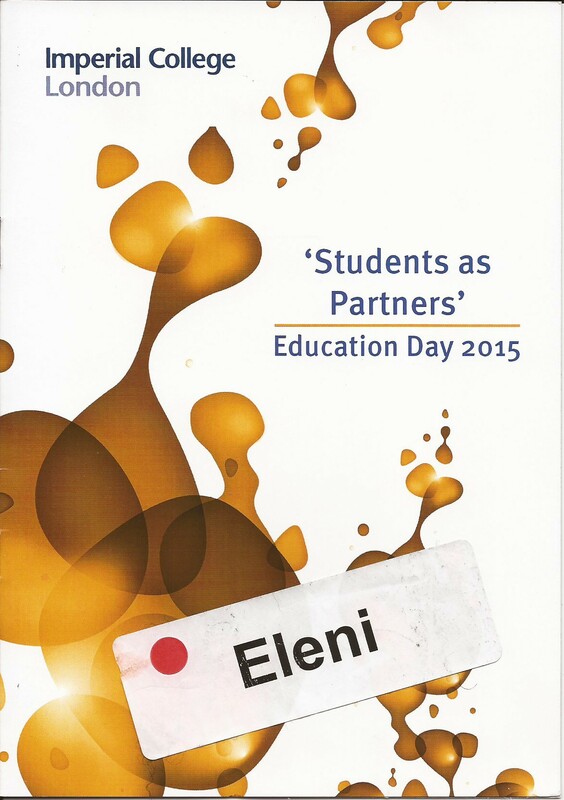 During the morning parallel workshops, I joined the group that looked at students as partners in the course design. Colleagues drew examples from their teaching practice and we all became aware of some excellent models of co-creation of learning design. Focus of students’ perspective: Ideas are coming from students and are intended for students. Content of course is always fresh: students bring their fresh ideas into the design. Disseminating power and expertise: Removing the expertise from the teacher and putting it in the room. From a rigid position to a constant flow. Students have more brilliant ideas than us and there is true benefit to everyone exposed in that sharing of ideas. 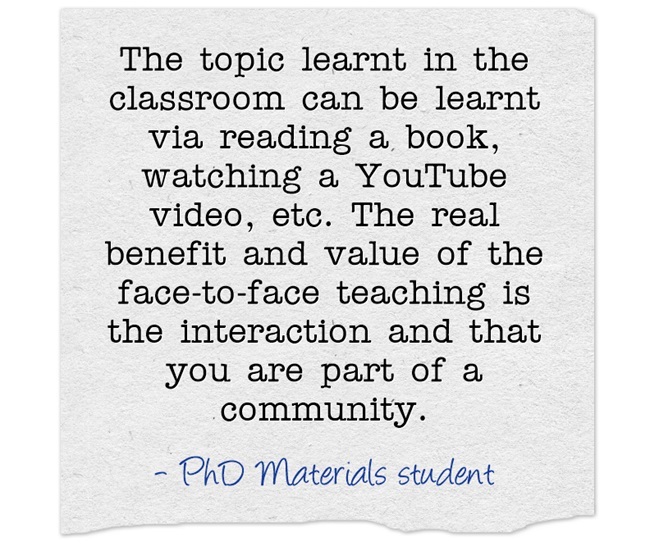 This student’s contribution in particular put me in a reflective mode to examine my practice and identify the value in the face-to-face teaching. If students can follow a video and learn the “how to”, the true value comes from the interaction and ownership of learning, understanding all the “whys”, and leaving the room with some unanticipated learning outcomes. Another important takeaway from the day came from the section discussing challenges and barriers as a result of partnering with students. In particular, it was noted that occasionally students’ feedback is harsh. They don’t know how to deliver constructive feedback which is frequently confused with judgemental criticism. A suggested solution to tackle inappropriate feedback came from a student noting that it is important to train undergraduate students on how to deliver constructive feedback. Partnership puts a lot of pressure to teachers. It becomes very difficult to manage students’ expectations (sometimes the origin of harsh feedback). There are a few more points that ignited my imagination during the afternoon activities such as the passionate teaching in the Chemistry Department. From a big idea of teaching students self-efficacy with a LEGO spectrometer to a simple operational detail of timetabling lunch-time breaks during Lab sessions. (Credits go to Prof. John de Mello for the timetabling algorithm). Another good practice example came from the Materials Department; Dr David Dye and his student Iacopo Russo shared how the teaching time is used to tackle threshold concepts with peer-instruction. David “flips the classroom” with recording his lectures and making them available to students prior to the “lecture”. The actual teaching time is used by the whole class to challenge their understanding, to make meaning and develop critical thinking and problem-solving attributes. David Dye and his student Iacopo confirmed that these lectures are very well attended despite being scheduled as a first slot on Monday mornings and his having released the content beforehand. Without doubt what motivates students to participate is not the content but the sense of belonging and interaction. The day concluded with Dr Tansy Jessop bringing her research-based perspective on the “assessment diet”, especially the one the modular provision of courses creates. Tancy Jessop brought along students’ data resulting from the TESTA (Transforming the Experience of students through Assessment) project. For me, being in a Department that we don’t traditionally exercise summative assessment, it is a real luxury to be able to focus my energy on Assessing for Learning (AfL) than assigning grades. On the other hand, for the same reason, students see the Library interaction as less important and don’t tend to participate in AfL activities even if I offer personalised feedback. Those few, in the past, who took up the opportunity confirm Tessy’s assertion that the learning journey for both students and teachers is very rewarding despite the risky nature of innovative assessment and feedback. It’s all about perspective! Healey, M., Flint, A. & Harrington, K. (2014) Engagement through partnership: students as partners in learning and teaching in higher education. The Higher Education Academy. [Online]. Available from: https://www.heacademy.ac.uk/engagement-through-partnership-students-partners-learning-and-teaching-higher-education [Accessed: 12 March 2015]. Zazani, E. (2014) Transformative and social constructivist approaches to designing courses and curricula: A portfolio. London, UCL. Institute of Education [Unpublished]. This entry was posted in #FHEA and tagged #studentsAsPartners, Conferences and Events, Feedback, Higher Education, Higher Education Academy, Imperial College London, Learning Design, LEGO spectrometer, Materials Department, Partnership, peer-assessment, Peer-Instruction, TESTA. Bookmark the permalink.